Since this game came out, this is one of the best looking bikes I've ever seen. It looks like a photograph.. O_o Really.. I LOVE all your works ! absolument sublime !! on croirait a une screenshot du film !!! 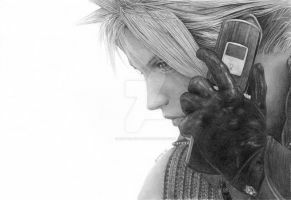 Cloud!!!!!!!!!!!!!!!!!!!! Nice work, especially on the bike. Holy shizz it looks like you just plucked it out of the movie or game it's soooo awesome! Cloud on the road, prety good. That makes me remember of the AC movie, I didn't get it too well because the game, the world in FF7 makes it dificult to have roads and woods like this, get it? That's only a detail in the movie, and awesome work. In the game there were trucks on roads, cloud and zack rode in one, so it's not impossible for there to be roads like this, they just don't emphasize them. Oh, I got it now. Yeah, that's just like it. I only tough weird in the movie (I think after credits) one road like any other on real life, but then I could think about this way. Holy.... f...ggh..... no, no I can't think of any word to describe how awed I am by this. love the light glow through his hair. was that effect c4d or photoshop? Damn it looks so real ! OH MY GOD!!! CLOUD!!! *O*!! esto va para wallpaper *-*! !